A well-integrated system. Basement Systems designs and manufactures all the key components in their waterproofing systems to ensure compatibility, top performance and attractive appearance. If you’ve ever dealt with a flooded basement, you know how messy, damaging and disruptive it can be. Knowing that your basement will stay dry gives you peace of mind. But how much should you have to pay? Keep reading to learn how to fairly compare waterproofing costs. There are several methods to keeping water out of your basement - and getting it out when it gets inside. Interior basement waterproofing, which involves moving water out of the home once it's inside, is typically the most cost-effective option. Excavating to install an exterior perimeter drain is typically the more expensive option. Don’t accept a “one-size-fits-all” waterproofing treatment, which some contractors provide in order to keep prices low. There are many variables that need to be considered when designing your basement waterproofing system: soil and site conditions, the way you plan to use your basement and your basement’s size, shape and construction details -just for starters. You’ll also want to consider the importance of battery backup capability to keep your waterproofing system operational when there’s a power outage. Does the contractor provide a dry basement warranty? What will the completed system look like? Will the waterproofing system make it more difficult to finish or remodel the basement? Will the basement waterproofing system work when there’s a power outage? What are my options to dehumidify the basement to remove dampness? In cold weather, can the discharge line freeze and cause backup flooding? 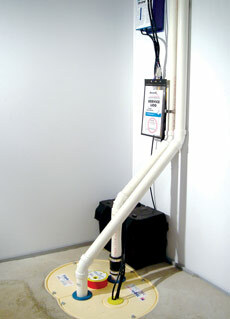 Is the waterproofing system compatible with a radon mitigation system that is or might be installed in the basement? Does the installer also provide maintenance and repair of the waterproofing system? Is financing available from the waterproofing company? Contact your local Basement Systems dealer in your area today for a free estimate on any basement waterproofing services.